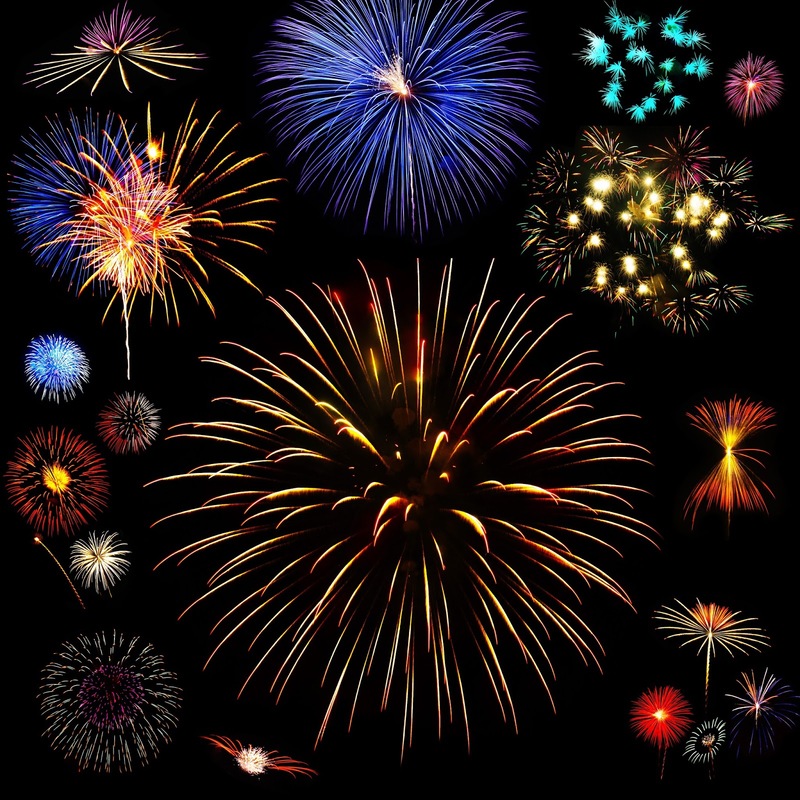 Celebrating Over 100 Sales This Year in My Online Store! Shortly before Christmas I hit my 100th sale this year in my Bay Moon Design online store! This will challenge me to surpass this target next year! I am very pleased and grateful to my customers. To celebrate I am giving back to my customers. I am offering 20% off all orders from now until 12-31-15. This is my largest discount offer ever. 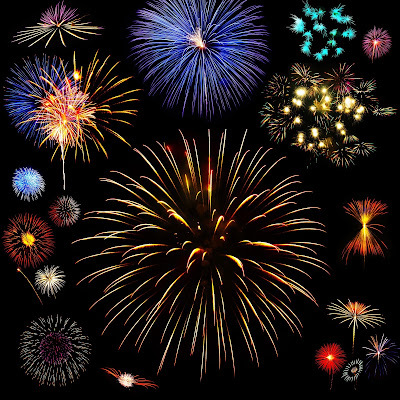 Use the discount code Celebrate at checkout at my store HERE. 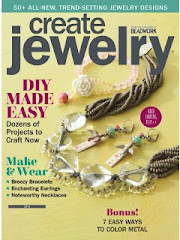 You can take advantage of this offer to purchase handmade cards and jewelry. Crazy title for a blog right! It does make sense. This is the monthly blog hop sponsored by We're All Ears- an earring blog hop. 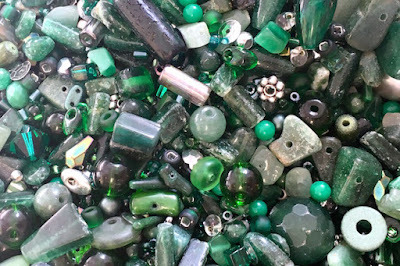 The leftovers are pairs of beads that turn into earrings. The directions that we were given are in bold print. 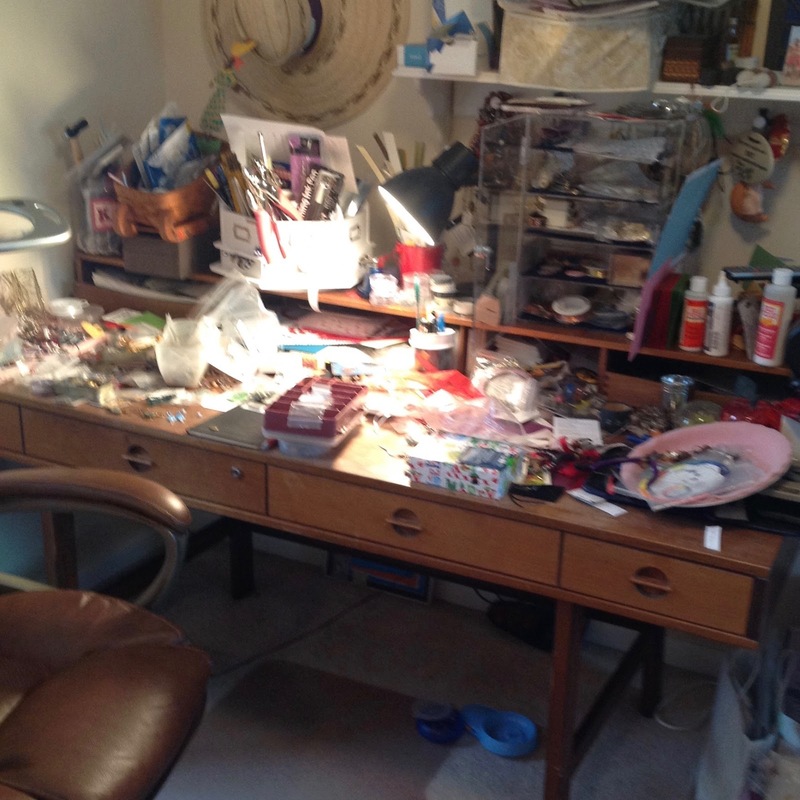 First, take a picture of the craftermath on your work table. I know this isn't pretty. It is dark and dreary just like the weather has been. Here is a thought--I have been cleaning up my worktable gradually all month getting ready for my move to Florida for the winter after the holidays. My family is coming for the holidays so I really need to get this room in order. Just imagine what it was like before! The sad thing is I really have made progress but it really doesn't look like it. 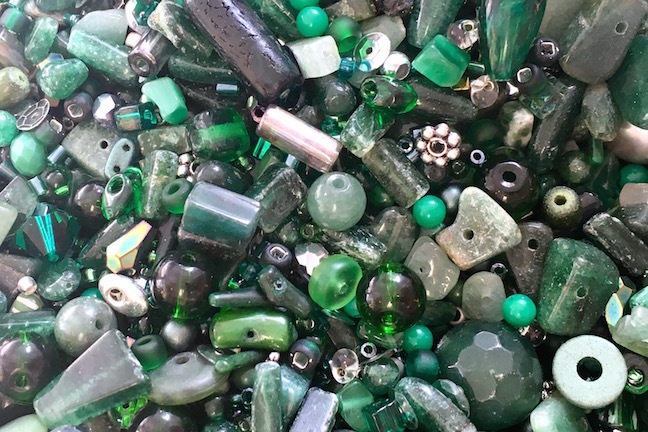 Next, find a divided box, bin, baggies or small bowls and go through the stash on your festive table picking out coordinated sets that you can use to create earrings. I discovered that putting the pairs in a divided box works really well for me. 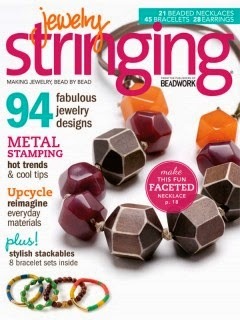 It is a great way to get organized and build your earrings. Prior to making this discovery I was putting all of my pairs lumped together into one big tin. I am so happy with this method that I am putting my art beads into a divided container too. Now, kick your creating into high gear! I set a timer for an hour 3 times in the past 3 days. This is a very good idea for me. I can get lost in my beads and computer. I also need to stand up and move around rather than sit for hours on end. I need to take care of my back or pay the price with pain. 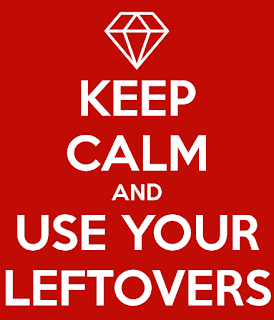 Let's get this leftover party started! While cleaning up my desk I discovered a bag of the oval shaped silver beads that I used in the earrings above. I also located on my computer these really glossy black beads that I love. 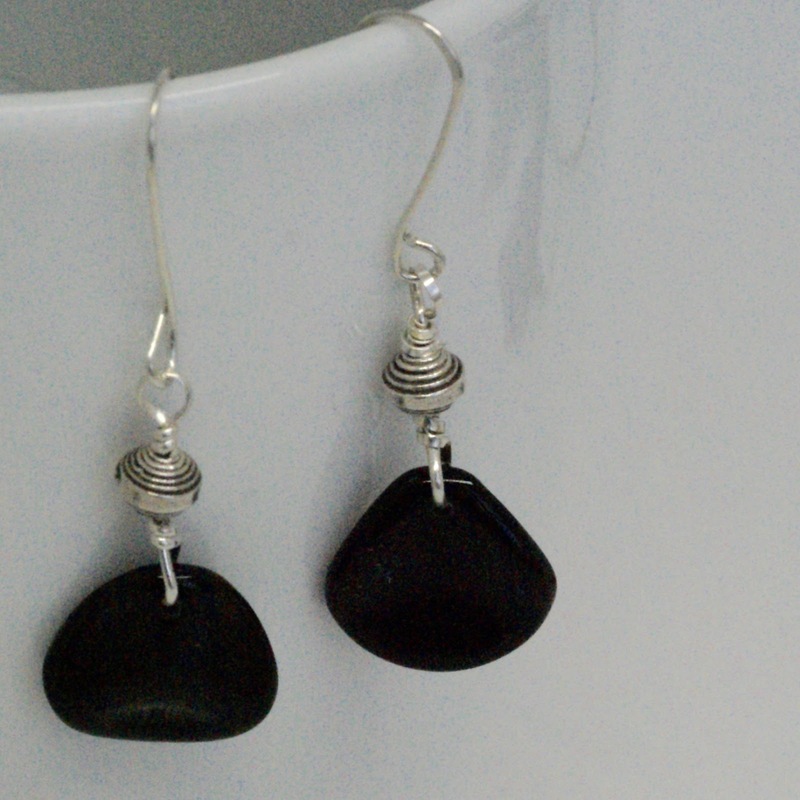 I think they turned into a great pair of edgy looking earrings and they are available for purchased HERE. The next pair make use of the green ceramics made by Marsha Neal Studio. I used dark forest green colored Irish waxed linen thread when I created them. I love the combination of the rustic ceramics and thread together. They have a casual appearance and are available for purchase HERE. I was anxious to add some blue earrings to my shop that will be perfect for the summer. 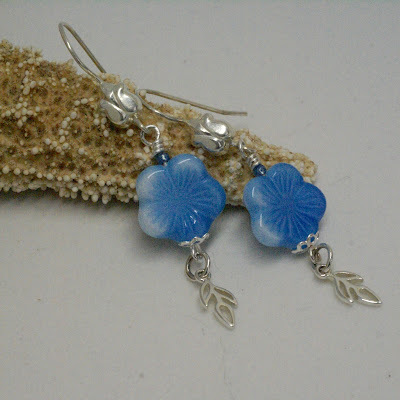 I have been want to make a pair of earrings with the blue floral beads for sometime now. Just yesterday I received the sterling silver leaves in an order that I placed. 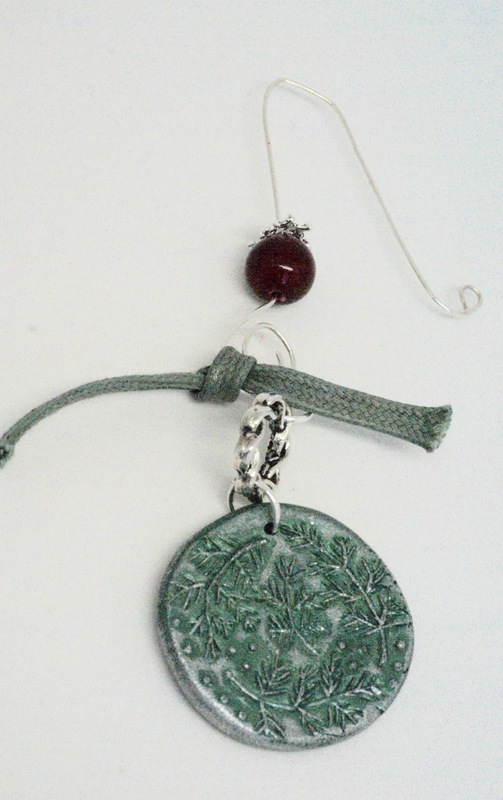 Sterling silver is very popular so I thought the leaves and flowers would work together will. 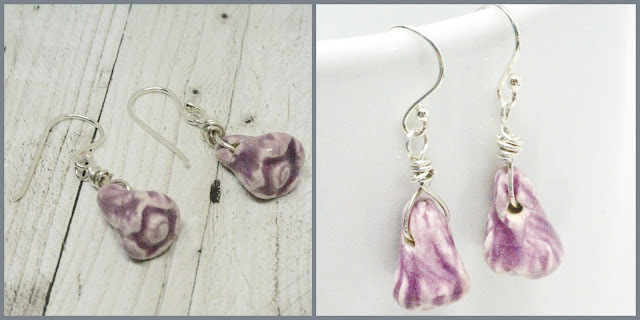 To continue with the floral theme, I paired them with some sterling silver floral ear wires. 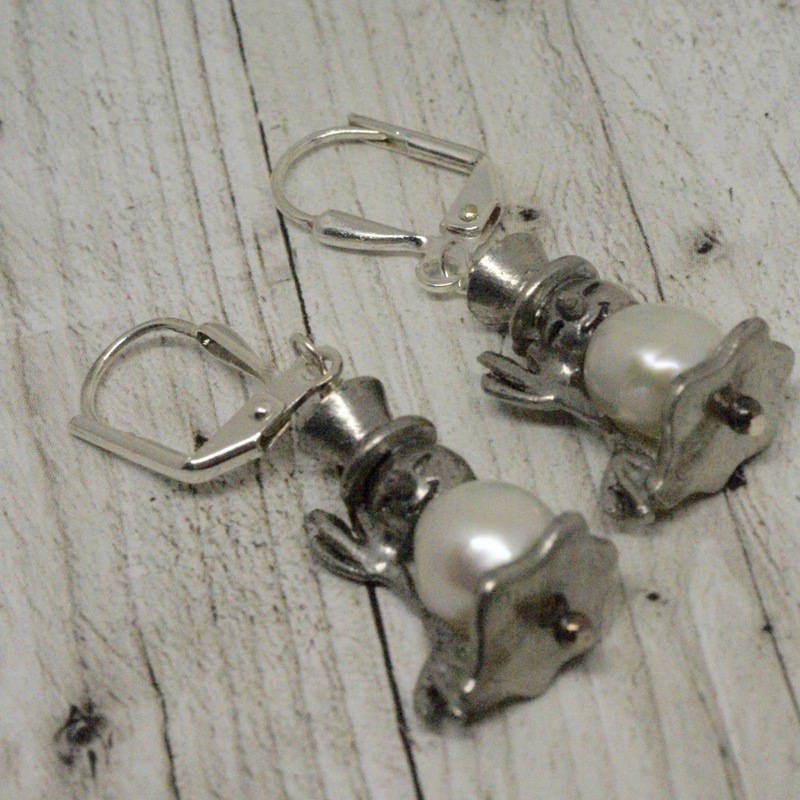 The pretty pale blue earrings are available for purchase HERE. Thank you, Erin and Earrings Everyday! for getting me more organized and inspired to make earrings. 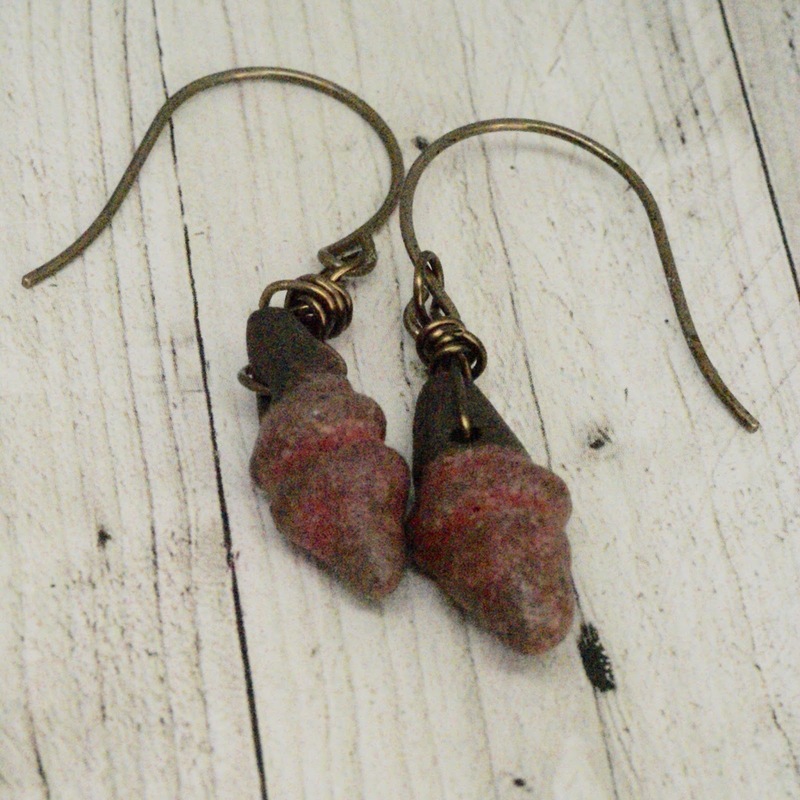 Go visit the We’re All Ears December reveal on Earrings Everyday and see what others made. Also, checkout their workspaces. Seeing others are almost as messy as I am gave me a little Christmas cheer. 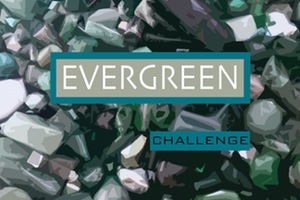 Welcome to the Evergreen Challenge sponsored by Andrew Thornton. 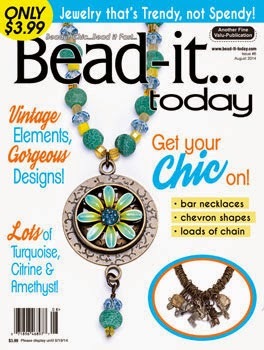 This kit features a selection of vintage acrylic, aventurine, waxed Irish linen, waxed cotton, vintage glass, vintage seed beads, Chinese jade, dyed pyrite and a Luxury Bead Blend. The Luxury Bead Blend consists of Japanese Miyuki seed beads, Toho seed beads, Japanese Matsuno seed beads, vintage Czech seed beads, freshwater pearls, glass pearls, Czech glass (both old and new), aventurine, jade, ruby zoisite, serpentine, stone, vintage sequins, vintage German plastic, dyed wood, German glass, electroplated hematite, Swarovski crystals, vintage Japanese glass, Javanese glass, and vintage lucite. The inspiration of this blog hop is-snow dusted evergreens. I love Andrew Thornton's special evergreen focal that he created for this and I thought it would be a perfect Christmas ornament. I added a red bead, jump rings, cord from the kit he sent and whipped up a silver hanger to put it on. I love to make earrings so I couldn't resist making a pair of silver freshwater pearl earrings from the silver pearls that kit included. 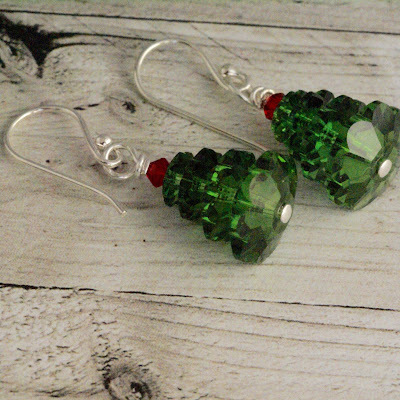 They are perfect for a special holiday event and available for purchase HERE. This is an inclusive creative challenge. Hanukkah, Kwanzaa or Winter Solstice themed decorations along with traditional Christmas ornaments are all possibilities. I wanted to make a Christmas ornament that will serve as a reminder of some favorite vacations. 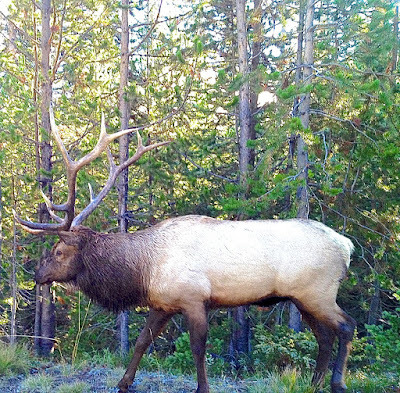 I selected the mighty elk. 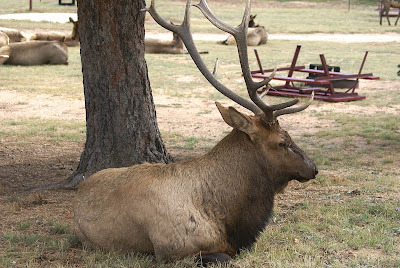 Last fall we went to Estes Park in Colorado at just the time when the elk were literally laying all over the very cute town. My husband and I spotted elk in the park, on the sidewalks around town and on the golf course. 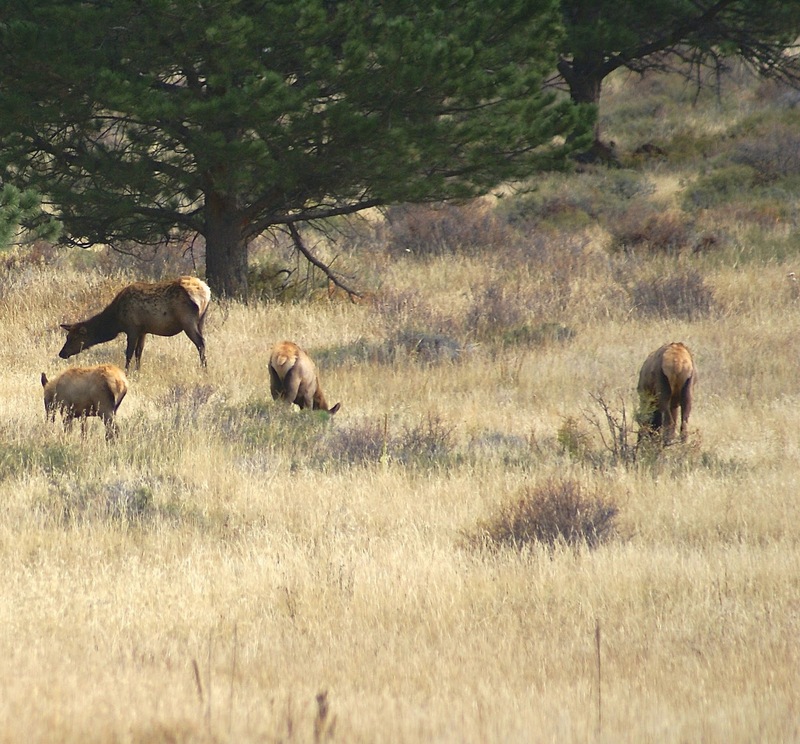 We also spotted elk in the wild of Colorado National Park. The year before we spotted elk in Yellowstone National Park in Wyoming. These magnificent animals provided us with much entertainment and joy. It was also a thrill to be able to capture a few photos of them. I saw a rustic looking elk pendant by Lipstick Ranch. It is fitting that Lipstick Ranch is located in Colorado. 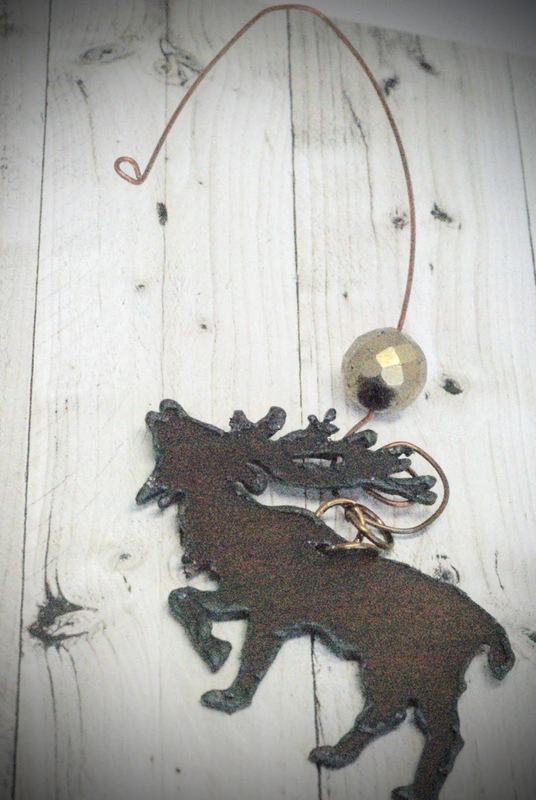 The Lipstick Ranch Rusted Iron Elk Pendant is 57x54mm so it is a nice size for an ornament. I can't wait to give it to my husband on Christmas. He loves to put the ornaments on the tree so I know he will be happy to receive it. I can't wait to see what everyone else came up with for this ABS Ornament Blog Hop. There is no greater inspiration than nature, and November’s Art Jewelry Element components were inspired by lichens. 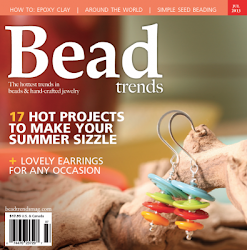 They were made by Caroline Dewison of Blueberribeads. 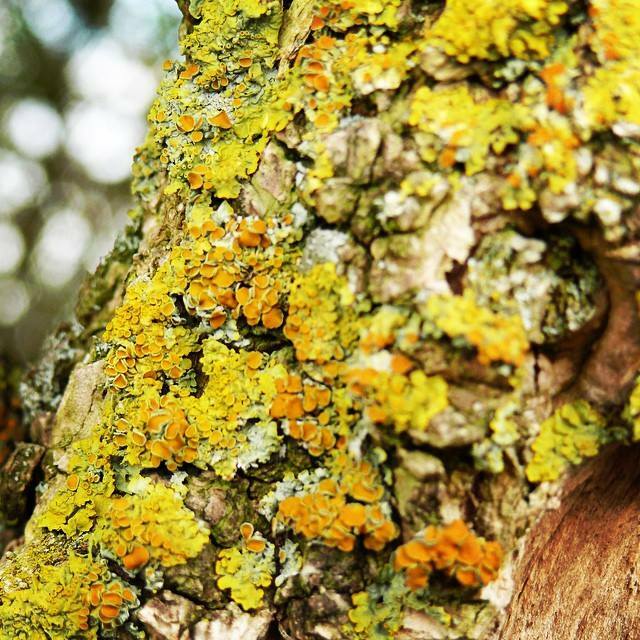 Caroline said, "I love to walk in the local woods, finding these little treasures on the bark of the trees. They make me think of tiny little worlds." These components are made from earthenware clay and have been colored with a combination of her own recipe glazes. Two components were given away this month. Nicole Prince and I are the lucky winners. I have to add that when my component arrived from the UK, I was stunned at how beautiful it was. The photo doesn't do it justice. The focal looks like it has pools of water sitting in it. The colors have an iridescence to them. As soon as I saw the lichen, I knew exactly what beads I was going to use. I had squirreled away a strand of biwa freshwater pearls that I got from the House of Gems awhile back, They have the same blue, purple, gold iridescent colors as the focal. I knew I had to save these gorgeous pearls for something special and this focal qualifies, I made sterling silver links and clasp for this special necklace. 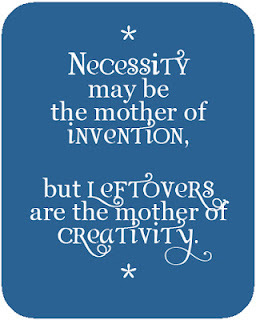 I love it and intend to keep it for myself! Here's the blog roll - enjoy! I can't wait to see what everyone did with this beauty. 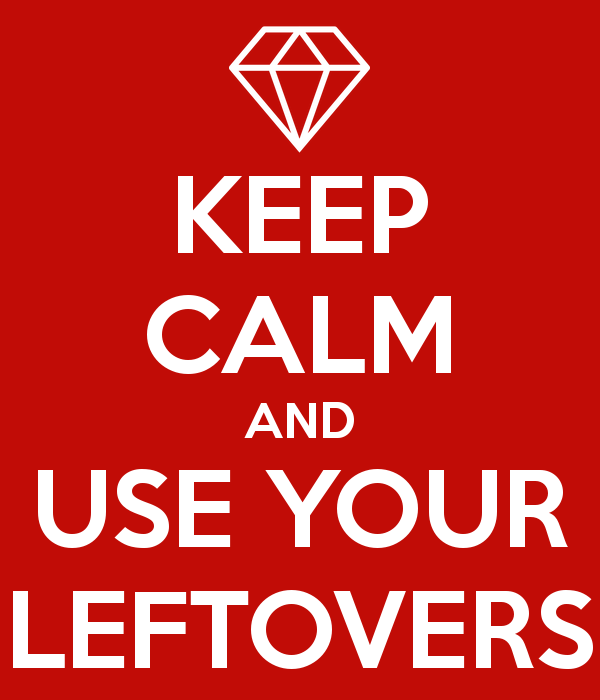 Let's Celebrate Thanksgiving and the coming of the holiday season with one of our favorite pastimes--saving money! Use coupon code FREEUS for free U.S. shipping and wrapping on orders of $20 or more from now thru Cyber Monday! All orders will be shipped Dec. 2. 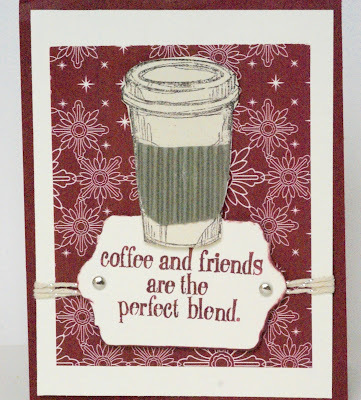 Bay Moon Design has been busy creating some new jewelry and cards with the holidays in mind. This is the time of year when my customers are looking for jewelry, cards and gifts for the holidays. I put together this small sampling of some of the new gift items. I hope something catches your eye! 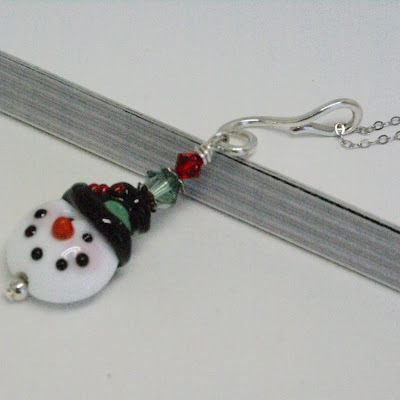 Another version of this artisan ceramic snowman is available on a 16 inch chain. 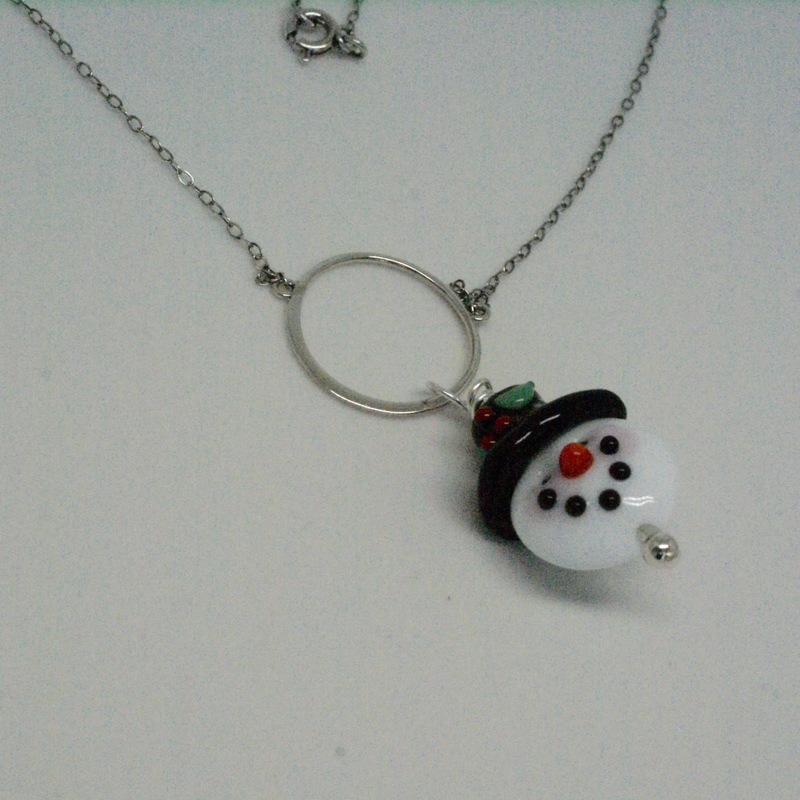 The snowman is suspended from a circle. These new designs plus others are available for purchase in my Bay Moon Design shop now. Don't forget that custom orders are welcome. Please feel free to email me at baymoondesign@gmail.com. I'm getting ready for the holidays by shopping online! How about you? 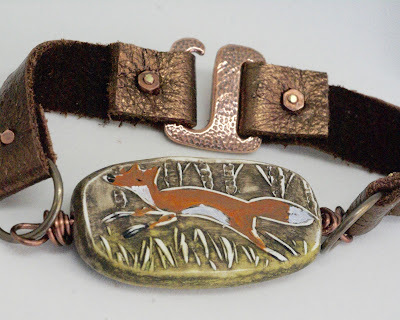 Once a month Erin Prais-Hintz selects an inspiration piece for she and her partner to use with Halcraft beads. This month I am her lucky partner. 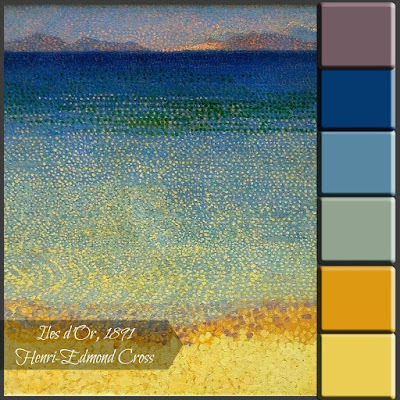 This inspiration piece is Îles d’Or (Islands of Gold) by Impressionist painter Henri-Edmond Cross. Îles d’Or are four islands off the southeastern French coast that must be magical. Legend says that the gods turned swimming princesses into the Îles d’Hyères. These islands are laden with mica-rich rock that glitters and gleams in the bright sunlight. At first glance it appears that the painting is just a simplistic color gradation. Upon further inspection, you can see the mountains of the isles in the distance, and notice the shimmering golden waves. 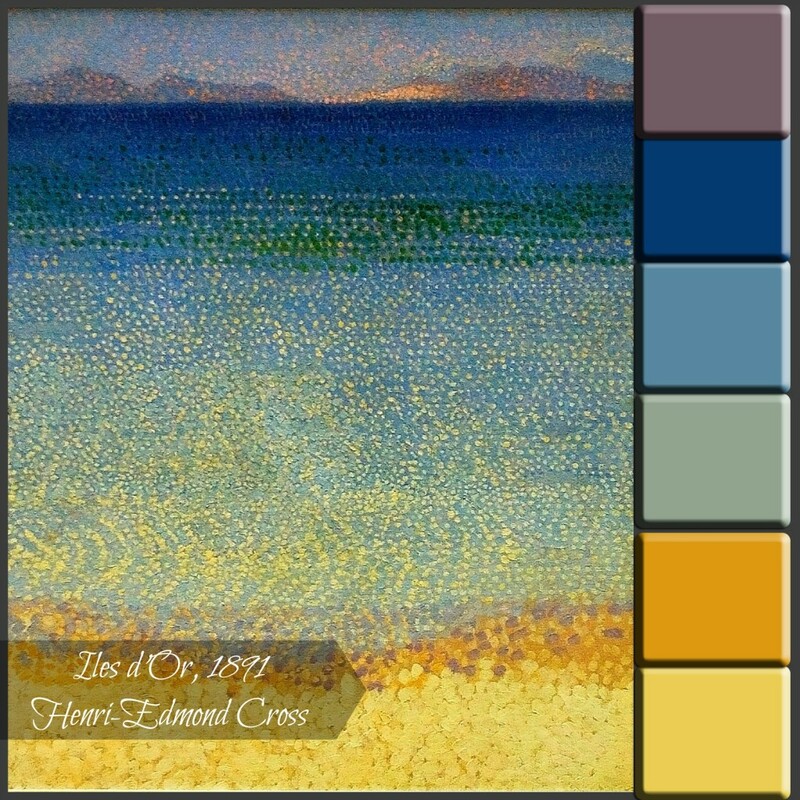 Erin Prais-Hintz selected Halcraft beads that are a cross-section of the colors in the painting. 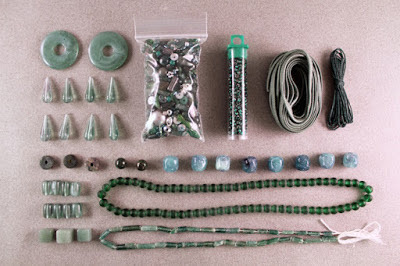 She also picked beads with a similar shape. Our Pretty Palette for November took me away on a vacation of mind, body and spirit to my winter home in the Florida Key. I was inspired by this seascape inspiration with turquoise water and it reminded me of the blue water in the Keys. 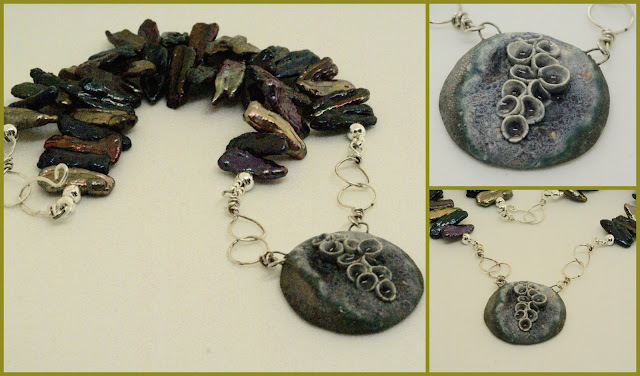 For my first necklace, I used the beautiful abalone nugget as the focal. I then selected beads that have a soothing natural color palette to go with the focal. I used almost the entire strand of turquoise howlite chips dyed stone and the aqua stones from aqua stone Chinese yellow quartzite strand along with the gold luster hematite stone. I absolutely love the gold luster hematite. I think that these beads are just gorgeous together. 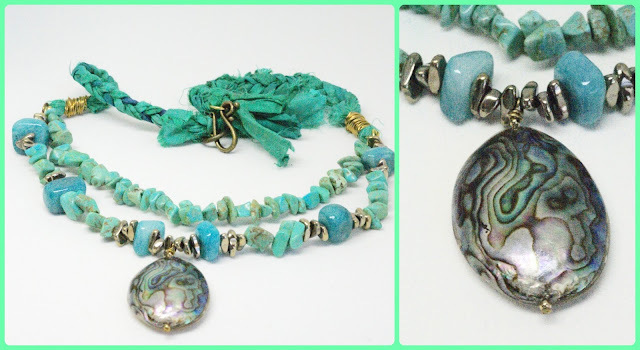 I found some sari ribbon that had similar colors to pull everything to together in this multi strand necklace. It is available for purchase HERE. The second piece that I created captures the beauty of the seaside landscape. The seaside landscape that I used as my inspiration is this beautiful ceramic bead by UK artisan Lesley Watt. I love red, white, and blue so I used those 3 colors with the ceramic. I used the blue stones from Chinese yellow quartzite aqua stone strand, white beads with specks of blue from my stash, and red Irish waxed linen thread. I made a sterling silver clasp with similar angles as the sail. If you would like to purchase this necklace, it is available HERE. 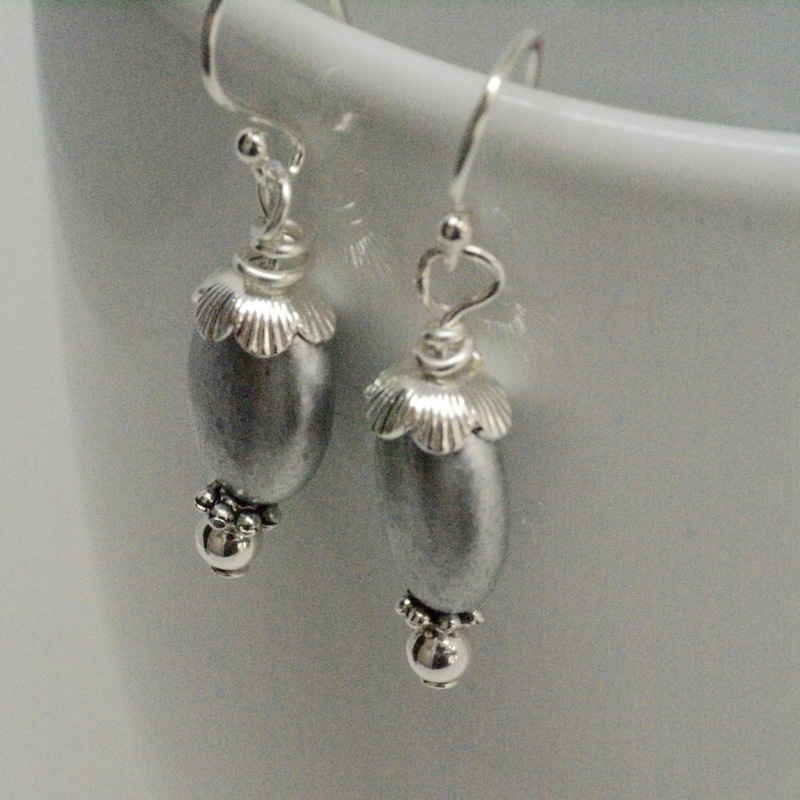 I love to make earrings so I had to include a pair. 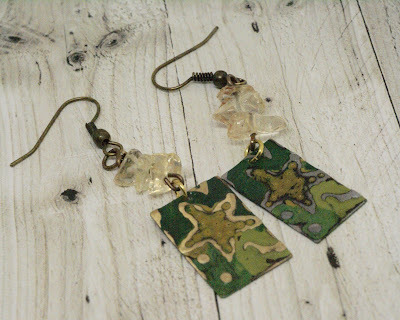 These starfish earrings use the semi precious citrine chips. These starfish earrings are made from natural brass sheets that have been embossed with a starfish pattern. 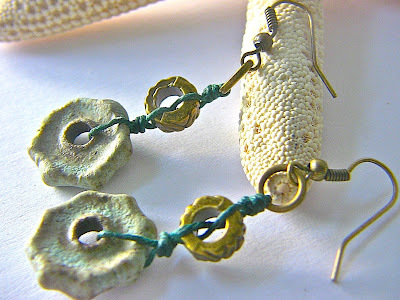 The earrings are hand painted also with yellow, blue and green patinas to create this beach jewelry. I used citrine chips to mimic the sand on the beach. The metal has a protective coating to keep the color vivid for years to come! I have hung them on brass ear wires. These handmade earrings are available for purchase HERE. 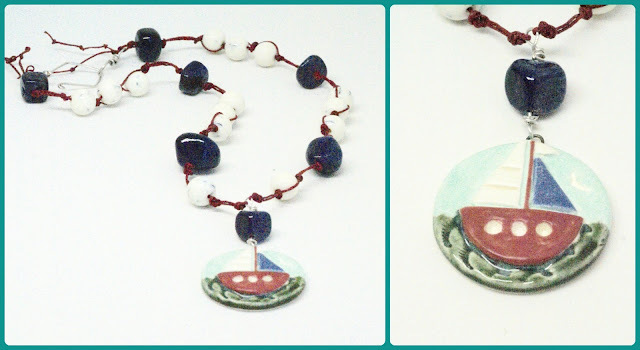 Stop by Erin's blog to see what she the gorgeous necklace she created with these same beads. Erin thank you for inviting me to be your partner and for selecting such gorgeous beads and inspiration for me. 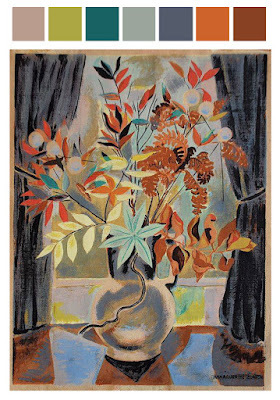 Autumn flowers by Marguerite Zorach is the Art Bead Scene inspiration piece for November, 2015. The colors are bright and fresh just as autumn days. This piece reminds me that autumn is filled with clear, crisp bright colors. Just look at the autumn sky and changing colors of the leaves! 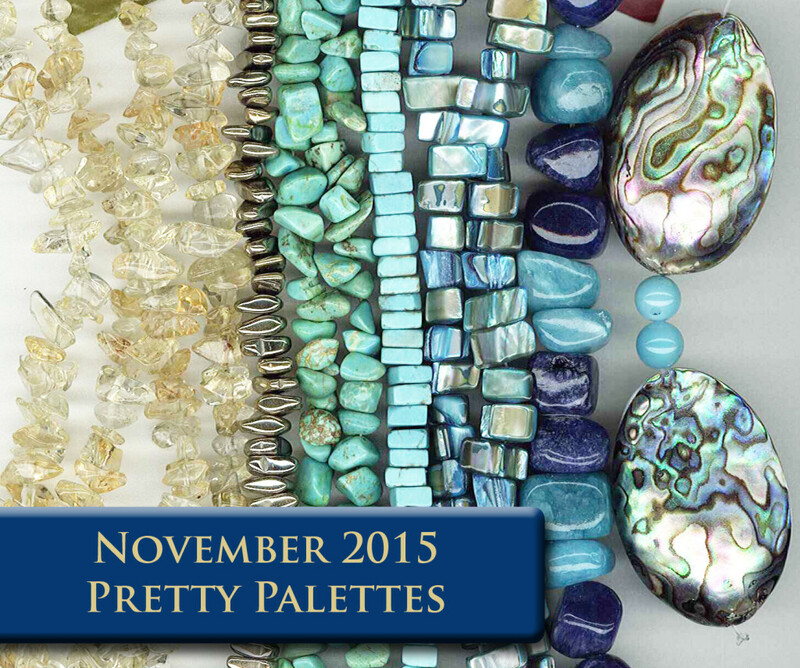 The color palette of this month's inspiration is a mix of muddy, tertiary colors. 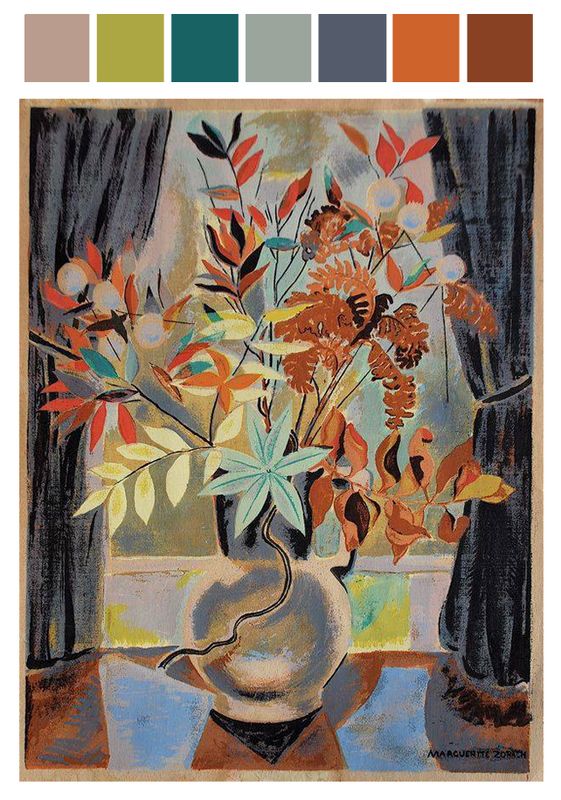 It offers the pop of teal, cornflower blue, olive green and wonderful rusty oranges. 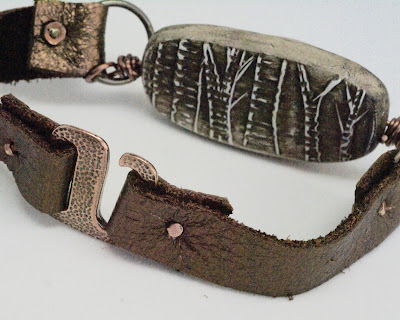 I read the Leather Bracelet with Micro Screws Nuts Tutorial by Powers of Humblebeads on her blog and I decided to give it a try. A real plus in this tutorial is that it lists component and where to locate them. It also has great directions with photos. I did deviate from the tutorial slightly when I used her fox component. It didn't have holes on each end like the bracelet bar in the tutorial. I had to create a loop and connect it to the jump ring and leave enough room to make a messy wrap next to the component. I then ran the wire horizontally through the component and make another loop. I used this loop to attach to the jump ring. Once again I left enough room to make a messy wrap next to the component. Now, that I made the bracelet I have mastered a new skill. Micro screws and nuts make this a no-fail project with very minimal tools and no riveting experience needed! In fact, I had the tools. I just needed to get the leather, E hook clasp, jump rings, micro screw and nuts from Lima Beadshttp://www.limabeads.com/. Now, go on and give this a try. It is easy peasy! November's We're All Ears challenge honors seed pods. Since the illustrations don't really have much in the way of color, the focus will be on the form of the pods. Their shape is to guide our creations. 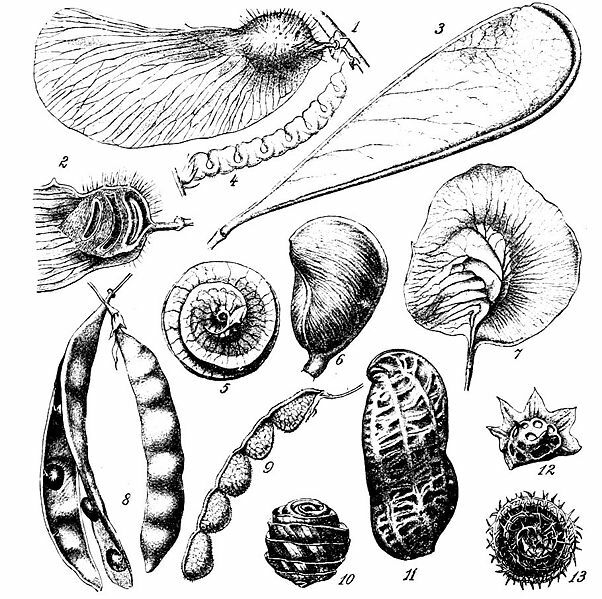 Number 5 in the botanical illustration above is the inspiration for the earrings that I created for this challenge. 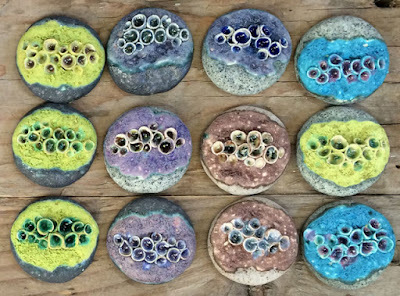 The ceramic beads by Marsha Neal Studio remind me of the shape of number 5. Since the mauve ceramics are already full of interest with the shape and color, I felt I only needed to add some sterling silver to make them into a pair of modern and minimalist earrings. The pale purple earrings are for sale HERE. What do you think? Did I capture create earrings that are the shape of pods? Tammy Adams, the Paisley Lizard, is the sponsor of this Superstition Blog Hop held on November, Friday the 13th! Tammy made black cats from polymer clay for all the participants to use. Thank you Tammy! This enables all participants to have fun posting our cat jewelry, adding photos. talking about superstitions, and hoping from post to post. This is a special blog hop for me because I love cats. I have 3 of my own and 3 grandcats. 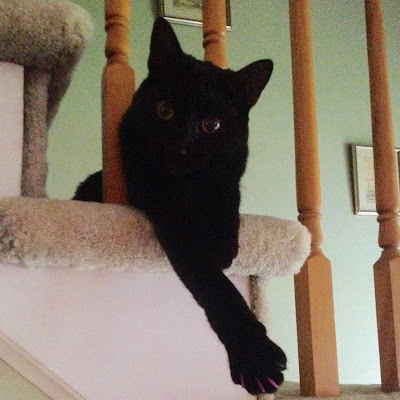 My daughter has a very cute American Bombay cat named Boo. I love how he looks like a panther. 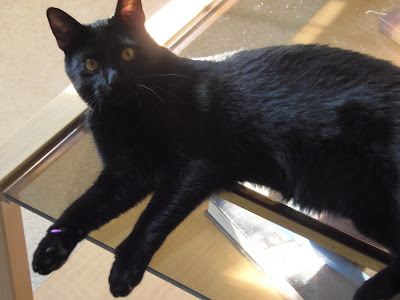 Superstitions about black cats originated long time ago and varies from nation to nation. Romans and Egyptians consider cats as sacred animals. Cat is worshiped in India and Israel. In European countries, a cat is not considered as a good animal (especially not black cat). In Western history, black cats have often been looked upon as a symbol of evil omens, specifically being suspected of being the familiars of witches. Most of Europe considers the black cat a symbol of bad luck, especially if one crosses paths with a person, which is believed to be an omen of misfortune and death. In the United Kingdom it is commonly considered that a black cat crossing a person's path is a good omen. Since I have positive feelings for black cats, I gave my polymer cat a whimsical look. 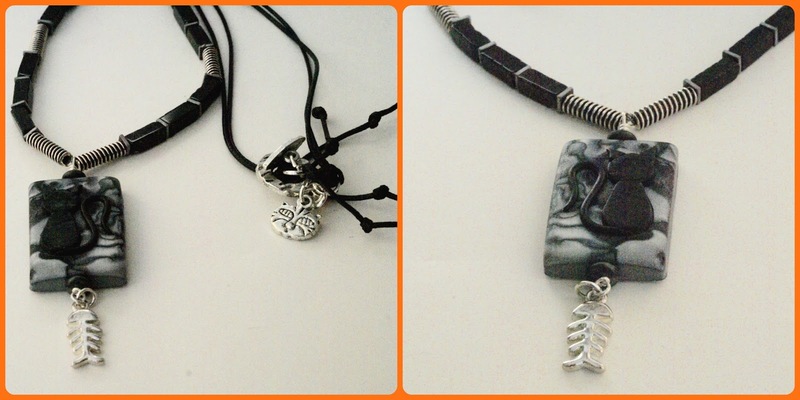 This whimsical black and gray cat necklace has a sterling silver fish suspended from rectangular black beads and black cord with silver accent beads. The whimsical look of the cat necklace is completed with a silver cat and tail toggle clasp. 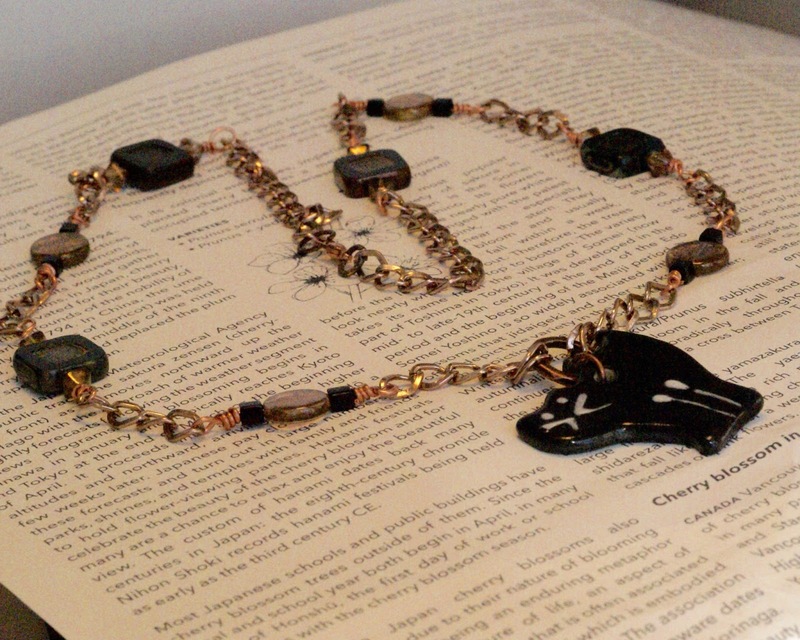 The cat lover necklace has a modern and minimalist look to it. Any cat lover or owner of a cat would love this piece of cat jewelry. The cat necklace is 20 inches around and is available for sale HERE. I made another cat necklace that will make a special Christmas gift for my daughter. The black ceramic cat pendant is suspended from a rustic handmade copper ring on a lightweight but strong copper colored chain. I added some square Czech glass beads, round golden brown beads added some sparkly beads to them and strung them on copper wire that matches the coppery colored chain. The chain necklace closes with a copper clasp. This piece of black cat jewelry has a modern and minimalist look to it also. Since she loves cats and has a black cat I think she will love it.